I'm so pleased to be participating in the blog hop for Fandangle, Christa Watson's newest fabric line for Benartex. Fandangle is full of bright prints in fun, modern patterns. I was drawn to the cool color way of her designs. After last month's Island Batik version of my Planned Improv: Scrappy Squares, I am excited to show a new variation on my technique. In my Planned Improv projects I have a general set of rules for creating the piece, and additional rules can give a twist to the design or provide continuity among different sections. Some of the rules I ended up following on this project include: the largest square is 12" finished, same general shape for each row, seven square along the top edge of each row (12" square in the middle), and rows off-centered from each other. I find that making a few adjustments to the design as I work can help add to the cohesive look of the overall piece. My quilt top finished at about 41" x 54" So many of these fabrics are great blenders that would be a lovely addition to any stash. For your chance to win a fat quarter bundle with a selection of 8 Fandangle fabrics, enter with Rafflecopter below by leaving a comment on my blog. Get a second entry by being a newsletter subscriber. Not a newsletter subscriber yet? Subscribe here, click to confirm your subscription in the email that comes to you. At the end of the giveaway I will email the randomly selected winner and they will have 48 hours to reply with their (US) shipping address or I will select a new winner. Thanks for visiting! Now you can view the finish. Click here to read the interview with Christa. Posted in Quilting. Tags: Benartex, blog hop, Fandangle, planned improv, scrappy squares on July 17, 2018 by sarah. Very cool! I love the colors and prints you chose. 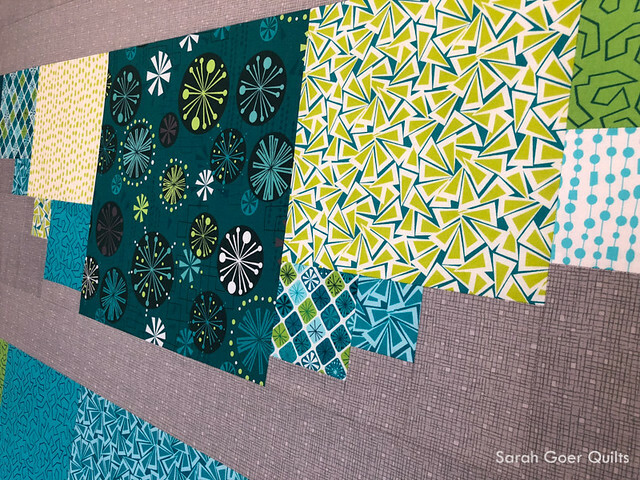 The cool colors in Christa's fabrics are beautiful! Great job on quilt! Aren't they fabulous!? Thanks for visiting, Anita! This would be a great charity quilt. Thank you, Christi. They go together really quickly, so I agree! I struggle with improv, but if all planned out, now, I could do that! Your design is perfect for large and small scale prints! Nice job, Sarah! Maybe you'll get to take one of my Planned Improv workshops someday! It would be so fun to have you in class. Thank you, Paige! Lovely cool colors in your modern take on Christa's new fabric line. Love the grey background to feature the designs. Thank you, Rosalind. I really loved playing with the fabrics. I think they would also be set off really nicely by a navy solid. Nice pattern! I love your planned improv! I love the cool colors as well. Thank you, Brenda. I had fun with it! I like the improv quilts. I love this colorway of the Fandangle collection. I really like how your scrappy squares method reads so differently in this quilt top. It's a great way to showcase Christa's new line. Thank you, Yvonne. I'm enjoying working in a series to add different twists to the design. Thanks for sharing your great quilt! Those fandangle prints are awesome. Aren't they!? Thank you for visiting. Cute quilt pattern! I love larger blocks that show the prints of the fabric. Good job! This turned out so fab!! Now I can't wait to see how you quilt it :-) Thanks for being part of the hop!! Thank you, Christa! I'm still thinking about how I'll quilt it. I love the teal fabric with the squiggly lines. Me too. I love a good tone on tone print. Thank you for visiting, Gene. Thank you, Tamara. I think I'll be making some small projects in these beautiful fabrics. That would be a fabulous print for bags! Thanks for visiting, Carla! Love your quilt and color selection as blues are always my favorite color choice. My first thought on your "Scrappy Squares" design was outstretched kimono sleeves for a quilt hug! Oh that's great. They kind of remind me of wings. :-) Thanks for visiting, Debra. Paper cuts and Triangle Trinkets are my favorites. Usually i gravitate to the warm prints, this time I'm loving the turquoise blues and greens as well. Thank you for sharing your quilt. The Triangle Trinkets is such a fun print with great movement. Thank you for visiting, Diane. Love the cool bundle. What a beautiful blue quilt this would make. Thank you, Shirley. It was fun to work with. I find your quilt to be intriguing. It is amazing how changing the fabric can change the pattern. All of Christa's prints are gorgeous but I like the large scale one that looks like jacks. Thank you for sharing with us. Part of the advantage of working in a series is seeing the variations. The large scale print is a fun one! Thank you for visiting, Rochelle. Awesome design, Sarah. Like you, I am totally drawn to the Fandangle cool colorway. So fun! I especially like TRIANGLE TRINKETS LIME/TEAL. Great pick! I just love teal and lime together. Thanks for visiting, Lisa Marie! I like your method of designing this quilt. The design really brings out the variety of fabric. I love cool colors. The gray background is perfect for this. Thank you, Sharon. It's great when a line has a variety of values. The light grey worked so nicely to contrast the medium/dark prints. Paper cuts in the yellow with orange/red is my favorite in this collection. That is a bright, happy print! Thanks for visiting, Suzy. Love the blue with the straight line meander-like design. how fun! That's Paper Cuts in Turquoise. Love it! Thanks for visiting, Patty. I think Fandango would be great to liven up the kitchen with placemats and potholders. That is a great idea! I may just have to make some turquoise placemats. Thanks, Nancy! I love the bright colors. I think the fabric would encourage me to try making a modern quilt. That's great! Thanks for visiting, Nancy. Love your cool quilt. Almost has a maps feel about it. Thanks for sharing. I like the two large blue prints used in the second and last rows of your quilt. One looks like fireworks, and the other kind of like opened paper fans. Great designs in her collection! That large one in the bottom row is Triangle Trinkets. It's fabulous! Thanks for visiting, Janet. Your improv pattern is so cool and the colours and prints are awesome!!! Lovely quilt - would be great for a teenager - nice and bright! I agree. Bright and a little funky. Fun! Thanks for the idea, Ali! Aren't they great!? Thanks for visiting, Barbara. Beautiful colors! You always know what looks good together! Well, thank you Shirley... though Christa and Benartex did all the work on making these look great together. :-) It's a great line. My favorite print of Fandangle is TRIANGLE TRINKETS TEAL Item #: 0769280B SKU: 7692-80. Love your scrappy square quilt top! That's a great one. I have a WIP that I may try to sneak some of that one into. ;-) Thanks for visiting, Nicole. Great pattern to show off beautiful fabrics. I’m loving the center fabric of the middle row. That one is Baubles and Bits in Teal. It's a great funky print and the red version is rad, too! Thanks for visiting! Beautiful fabrics and wonderful ideas. All the fun prints and patterns from Christa's newest collection just shine in your planned improv design. I really like this newest layout variation too...very fun!! Happy quilting ahead! I do love how some of these are wonderful blender fabrics! Really love the grey background fabric! Thank you, Lee. I could own a whole bolt of that grey! There's also a dark grey version of Confetti Crosshatch. I love your idea, makes me think of quilts on the clothes lines! Thank you, Patti. I wish my wardrobe was this colorful! Christa has some skirts from her Sparkling Squares prints. They are delightful! I think I would make a throw quilt--I like the turquoise print also!! It would be such a happy throw! Thank you for visiting, Barb. I really like your quilt top, I can't wait to see how you quilt it. Triangle trinkets in teal is my favorite print, though I also love all of the confetti crosshatch prints. Great choices! The Confetti Crosshatch prints would be so versatile in any quilt! Thanks for visiting, Linda. What a great design. Thanks. 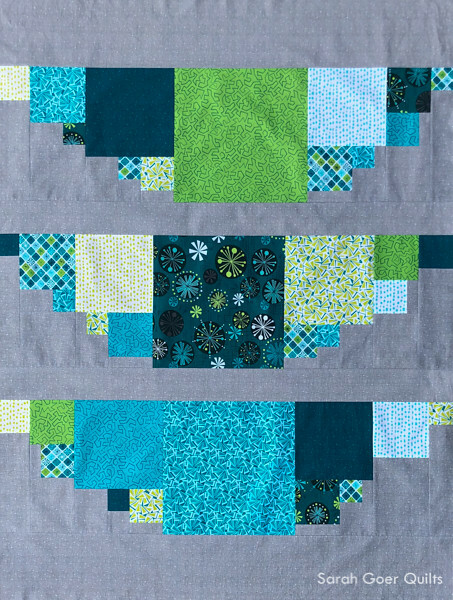 My favorite print is the teal baubles and bits and I think your improv quilt is gorgeous. Thank you, Judy. The Baubles and Bits prints really remind me of ornaments. Someone else said she'd like to make bags with that print, which I think would be delightful. I would make a picnic quilt to leave in my car. The one I have now has fabrics from clothes that I and my mom wore. You picnic quilt sounds like a lovely memory quilt. I agree that these prints would make a delightful, happy picnic quilt. Thanks for visiting, Rita. Hi Sarah! I do love the cool colors of Christa's Fandangle fabrics. They are so fun! They are full of great, saturated color. Thanks for visiting, Sandy. 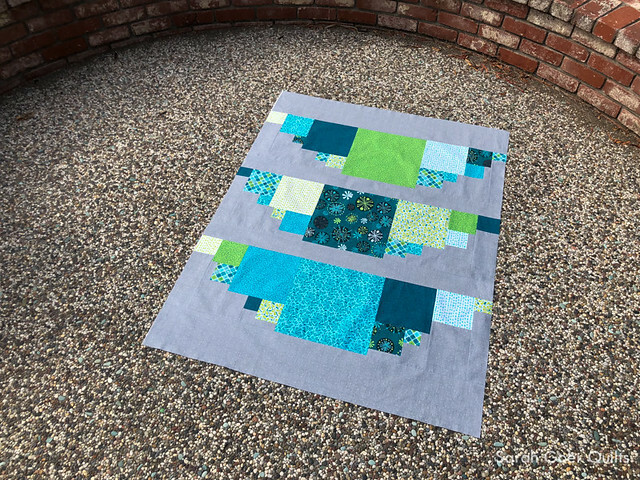 A great scrappy improv quilt! I would use the fabrics in an ocean inspired quilt. Oh, that would be fabulous! Thanks for visiting, Anita. It's a great fabric collection. You did a great job. I love the Triangle Trinkets in teal! But the Confetti prints are beautiful too, and would be so nice to have in my stash since I always lack blenders. I love hearing how you use Planned Improv-- so interesting! I like the colors you used. Thank you for explaining a little of how you design a quilt. Most times we never know why someone's pattern is designed as it is. I enjoy sharing my process (sometimes along the way, sometimes in the "finish" post). Thanks for visiting, Nancy. I also love the Red/Gray curtain, so versatile!! Baubles and Bits is a great larger scale print. Someone else pointed out that it would be fun on bags, which I have to agree! Thanks for visiting, Jenny. I’d like to use these fabrics in a log cabin quilt. Thanks for sharing your cute quilt. Oh, I'd love to hear more about how you'd build your cabins. My mind went immediately to cabins that were half cool and half warm prints when I read your comment. Thanks for visiting, Cecilia. I really love this fabric collection. I would use it in a scrappy quilt. Your quilt is a great design to show off these fabrics. Great job! This is a great way to adjust e original pattern. It kind of looks like a line of clothing or sheets on a clothesline. I just think it’s great the way it works out. Thank you, Kathleen. The wonderful part about doing design work from a technique versus a pattern is the ease of moving into variations. I love that a couple of you have seen that clothesline image. Fun! 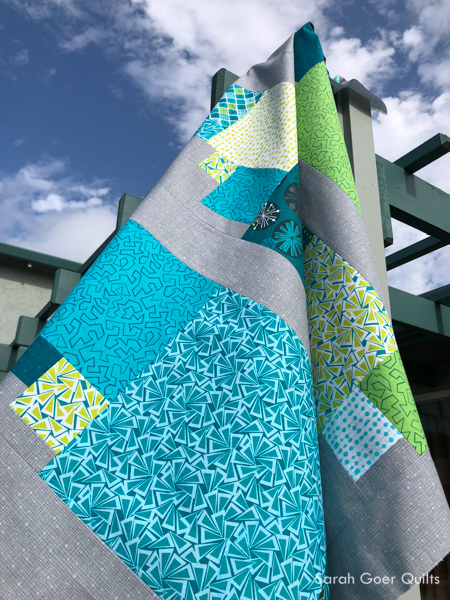 Thanks for sharing your quilt - love the colors! Thank you, Nancy. Glad you enjoyed it. I really like all the Fandangle prints. They work so well together! Indeed! Thank you for visiting, Judy. Greetings from foggy Cape Breton! I don’t have a favorite print because I love it all! The bundle showcases my favorite color combinations. Waving from across the continent! I'm glad you enjoyed checking out Fandangle. Thanks for visiting, Kaholly. I love your quilt design. It is hard to pick a favorite piece of this line, there are so many favorite/ great fabrics. From the circles/baubles to the triangles/confetti. I would love them all equally without picking favorites!!!! I agree that there are so many great prints and blenders. Though Sparkling Squares in Teal is my favorite. It will be my backing (and binding, I think) for this quilt. Thanks for visiting, Cindy. I'm loving this line! Your quilt shows off the patterns beautifully! I love the funky patterns in that one. Thanks for visiting, Jayne. oh i love your quilt. it is so fun and pretty. i would love to make a quilt like yours with the cool color way. I would love to make a quilt for my great niece with the warm color ways. It would make a fun, happy quilt to give as a gift. Thanks for visiting, Lori. Beautiful fabric and a great pattern! Love your pattern with these fabrics. It almost looks like clothes hanging on a line. My favorite print is the one with the darker background that looks like fireworks. I love that you liken that print to fireworks. That one is called Baubles and Bits. There's a red version, too. Thanks for visiting, Karen. I'm loving this fabric line! Me too! Thank for you visiting, Tami. Wow, I love these fabrics together! Looks great! Thank you, Emily. They are super fun to work with. I would use the Fandangle bundle to make a set of summer placemats for dining on our new deck this summer! The colors and prints are perfect for summer fun! Sounds like a great summer project! Thanks for visiting, Kathy. Your quilt looks like a fun, quick quilt to make for a little one or to take on a picnic. The cool colors are so pretty and soothing, great for a hot summer day! I need a picnic quilt. Maybe I'll super-size this one. :-) Thanks for visiting, Ellen. Placemats, I think...I have a Fiesta brand tablecloth and those blues would look fabulous against it. Great idea! The other thing about placemats is that they are a quick project. :-) Thanks for visiting, MaryAnne. Beautiful work. Your quilt could pass as a Kimono quilt. I love her geometric designs. That would be such a fun quilt. Thanks for visiting, Samantha. Love Christa's new fabric collections. Your quilt really showcases the pretty prints. When I first saw your quilt, I thought it was a row of quilts, hanging, and thought each of them was quite pretty. :) I've been sick, and my fevered brain has given me an interesting POV on things. I should grab a sketch pad before I return to my usual, rigid way of seeing the world. I hope you're feeling better soon. I'm glad you enjoyed my quilt. Thanks for visiting, Beth. Love the combination of colors you chose...so rich and vibrant! Thank you, Sandy. They would make a wonderful baby quilt! What a great way to highlight these beautiful fabrics! My biggest recommendation for scrappy improv is to pare down to a limited color palette. Sometimes scraps from one project are a good way to start, since they already go together. Thanks for visiting, Sharon. That one is Baubles and Bits. It comes in red, too. Thanks for visiting, Susan. Great design Sarah! And these colors are perfect for you. Thank you, Elizabeth. It is a very "me" palette. I love batik fabrics, no matter what you do with them, they seem to look fabulous! I have used batiks in most of my recent quilts. Thank you for visiting, Rosemary. I love the temperature of the colors! Thank you! 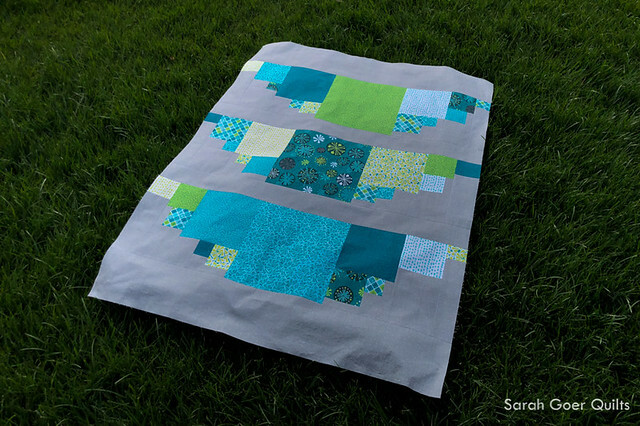 What a beautiful, quilt, Sarah, and of course, I absolutely love your color palette! Take care, Mary. Christa and I have a similar passion for bright colors. Thanks for visiting, Mary! Amazing that what you call a "Scrappy Quilt" can be. The fireworks are a great vision and what a fun wedding date! Happy Anniversary, Thunder! How wonderful! The background fabric is perfect! I love the cool colorway that you have put together. All I could think is that my niece would love these colors. There is so much movement in the patterns of the Fandangle prints. Christa picked a great palette. Especially her cool colors! :-) Thanks for visiting, Mary. I love Baubles and Bits in the teals/limes the best. I would love to make a bed runner. I've never made a bed runner. I should keep that project in mind. Thanks for visiting, Danice. I think I like the teal starbursts. I like your planned improv quilt. It is awesome and sure showcases the fabrics. Great job! Thanks for participating. I had to subscribe before I could post a comment and now I'm forgotten the name of the fabric. I'll call it the teal snowflake or starburst. I hope that descriptive enough. I think it's gorgeous. As a matter of fact, it's unusual and there is not a fabric that I absolutely dislike in the bundle. I like the fact that there are warm and cool colors in the collection - that should mean that there's something for everyone. Of course, I know you can't please everyone but this should come close. I like your planned improv quilt. I like that description - "planned improv." I think many people think improv is totally by the seat of the pants when actually there is lots of planning involved. Thanks for participating and sharing your quilt. I think you might mean Baubles and Bits. I agree that all of the prints are so lovely. And as for "Planned Improv" when I describe what I teach I like to say "I like improv, but I also like rules." Planned Improv is an improv technique that works for me. I know there are other quilters who have less of a plan than I do and create wonderful quilts. It's so nice that there is so much variety in quilting that we can all find what speaks best to us. Thank you for your comments, Susan. I love all the different places you chose to take pictures. It's up. It's down. It's inside. It's outside. Works for all different spaces! Ha! I hadn't really thought about it that way. Thanks for the perspective, Amber!